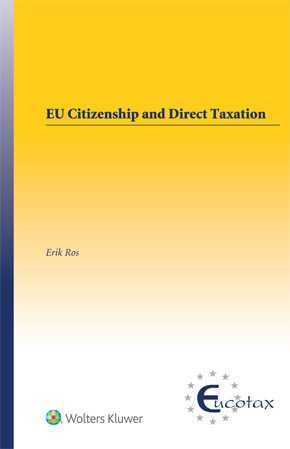 EU Citizenship and Direct Taxation is the first book to investigate in detail how the Court of Justice of the European Union (ECJ) has tried to reconcile specific national direct tax rules with the general European Union (EU) principle of free movement of persons from the perspective of EU citizenship. Freedom of movement is a key principle of the EU resulting in the right of every EU citizen to move and reside freely within the EU. Many EU citizens work in the other Member States than their Member State of origin. Direct taxes are not as such covered in the treaties and therefore have a much smaller basis for harmonization at EU level than indirect taxes. As a result, decisions of ECJ on the clash between the EU principle of free movement and Member States’ direct tax rules have a significant effect on national direct tax systems. This book focuses on the relation between free movement rights of EU citizens and the legal autonomy of Member States in the area of direct taxation. numerous tax policy initiatives with regard to EU citizens before and after the Treaty of Lisbon. The willingness at EU level to make EU citizenship a key driver behind the European integration process relates to the purpose of this study. This book explains that the ECJ is reconceptualizing the market freedoms relating to the free movement of persons as part of a broader EU citizenship right for all economically active EU citizens to pursue an economic activity in a cross-border context; a right beyond the aim of realization of the internal market. This book proceeds confidently through the maze of rules that relate to the notion of EU citizenship and gives a broad understanding of the concept of EU citizenship in the EU’s constitutional and institutional development. As an extremely important analysis of the influence of EU law on the direct tax autonomy of Member States, this book will be a great influence in the practice and study of taxation in the EU. Chapter 2 How Can the Relationship Between the EU and the Member States Be Characterized in General? Chapter 3 To What Extent Are Regulatory Competences in the Field of Direct Taxation Attributed to the EU Level? Chapter 5 What Is Meant by “Citizenship” and “Nationality” and How do These Concepts Relate to EU Citizenship? Chapter 6 What Rights and Duties Are Attached to EU Citizenship? Chapter 8 Which National Rules Constitute an Impediment to Inter Member State Movement According to the ECJ? Chapter 9 Do Non-discrimination and Market Access Provide an Adequate Conceptual Explanation for the Expansion of the Scope of the Treaty Provisions on the Free Movement of Economically Active Persons? Chapter 10 Has the Notion of EU Citizenship Widened the ECJ’s View on Treaty Access? Chapter 11 How Has the ECJ Interpreted the Concept of Free Movement with Regard to Economically Inactive Persons? Chapter 12 How Has the ECJ’s Changed Perspective on the Scope of the Treaty Freedoms on the Free Movement of Economically Active Persons Influenced the Fiscal Autonomy of Member States? Part IV Towards a Citizens Europe? Chapter 13 What Kinds of Measures Have Been Taken since the Treaty of Lisbon to Bring “Europe” Closer to the People? Chapter 14 What Kinds of Tax Policy Initiatives with Regard to Citizens Have Been Taken at EU Level Since the Treaty of Lisbon?